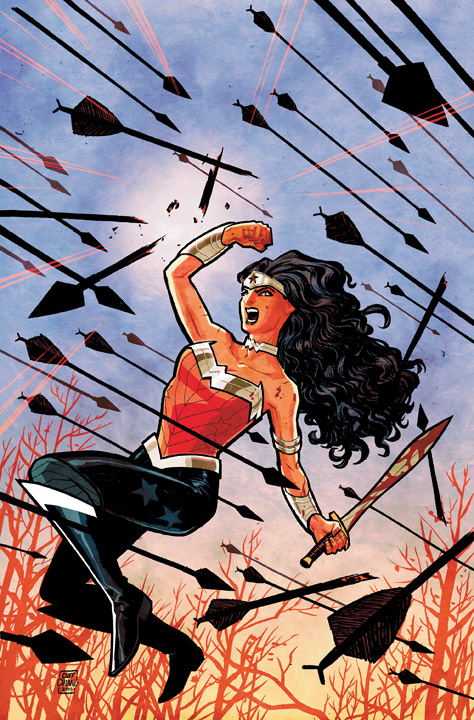 Brian Azzarello And Cliff Chiang On New Wonder Woman #1!!! This is SPECTACULAR news!! I’m so excited I don’t even know what to do with myself. I was in my mother’s store this afternoon, checking my mail, and I thought “I should see if there’s any new DC relaunch news”. So I went to DC’s Source blog, then shouted out “OH MAN!! !”, surprising my mother, her coworker, and a bunch of customers. My explanation of “AZZARELLOANDCHIANGAREONWONDERWOMAN!! !” didn’t really make sense to anyone, but we sorted it out. No one was as excited as me though. I still can’t believe it!! This is going to be AMAZING!! First off, Brian Azzarello is an unbelievable writer. 100 Bullets is one of the best few comics of the last decade, if not of all time, his Superman: For Tomorrow run with Jim Lee is my favourite Superman story ever, and his occasional Batman comics have been ridiculously good. Azzarello’s worked with Cliff Chiang before on a Dr. 13 story which was hilarious and awesome, and they are the PERFECT pair for Wonder Woman!! I’ve bought so many comics I didn’t give a hoot about at all just to see the Cliff Chiang art… the guy is a FANTASTIC artist with a cool and unique style that is going to work so well with Wonder Woman. In one of the first posts I ever wrote when I started this blog, I said that Cliff Chiang should draw Wonder Woman, and now it’s happening!! DC editorial obviously reads my blog. So yeah, I CANNOT WAIT for this book!! I literally could not pick a better team for Wonder Woman if I tried… were I the editor of Wonder Woman, Azzarello and Chiang would be the first guys I called. I’m over the moon about this… it’s going to be SO fun to read!!! I was really concerned about Wonder Woman when DC announced their relaunch, but now I’m not concerned about anything at all. They could tell me tomorrow that Rob Liefeld is drawing Batman and I’d think “well, these are the guys that put Azzarello and Chiang on Wonder Woman… I’ll trust them.” GOOD WORK DC!!!!!!!!!! This is the best thing you’ve done in AGES. This entry was posted on June 2, 2011 at 7:02 pm and is filed under Comics, WW Comics. You can follow any responses to this entry through the RSS 2.0 feed. You can leave a response, or trackback from your own site. can’t wait to read this book! I reckon Megan Fox should be the next wonder woman, she would be great at it.